The term Gaslighting originates from a 1938 play “Gaslight” and its 1944 film adaptation, in which a husband tries to make his wife believe that she is insane by using manipulative tactics. 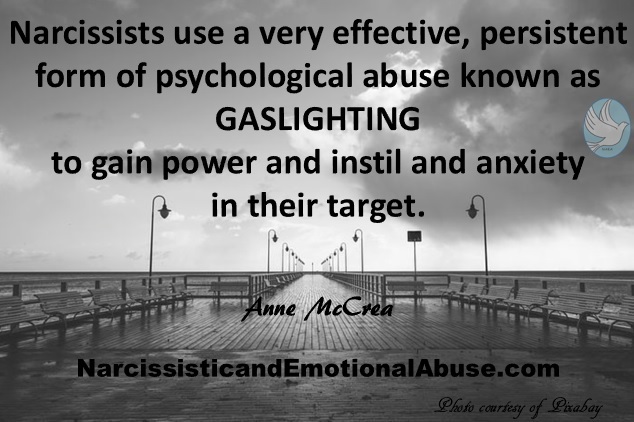 A narcissist will use a very effective, persistent form of psychological abuse known as gaslighting to gain power and instil confusion and anxiety in their target. 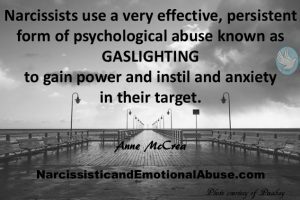 Gaslighting is an insidious process that occurs over a period of time, resulting in the person being gaslighted questioning their own reality and/or sanity. They will no longer feel that they can trust their own judgement and memory. When someone’s recollections of events are constantly put in doubt, it is inevitable that they will wonder if their own version of events is indeed correct. Their self-esteem and confidence will plummet, and they will start to believe that they can’t function independently, finding it difficult to make decisions. Anyone is susceptible to this form of abuse, which is akin to brainwashing. Snide comments and a little lie here and there will more than likely go unnoticed. As time passes, these will escalate and even the smartest, mentally stable person can fall prey to such manipulative tactics. They will find themselves being reminded of their shortcomings and weaknesses so that they feel there is something wrong with them and they become so grateful to have the narcissist in their life. Lies become the norm so that they have no idea what are lies and what is the truth. When lies are so utterly convincing, they will inevitably doubt their own perceptions. To add fuel to the fire, the narcissist who is trying to wear you down will throw in a little praise now and then. Now you are more confused. You must have got it wrong. They’re not so bad after all. It must be you getting things twisted. The intermittent put downs and praise increases your anxiety and stress. You’re walking on egg shells in an attempt to please, but whatever you do, it’s never quite right. They will continue to ridicule you and point out your flaws. You find yourself always on the defensive and apologizing when you’ve done nothing wrong. In your mind, you must have upset them, so it must be your fault! Isolation is another one of their ploys. When they have succeeded in isolating you from friends or family through, yes, you’ve guessed it, more lies, you will feel that you have no one you can trust except the person who you can trust the least, the narcissist. You are insecure and in a weak position, just where they want you, confused and isolated. The manipulator may relate a story, leaving out certain information. When they convince their target that they told them specific details of which the victim has no recollection, they will start to think that they are losing their memory and their mind. The gaslighter will question their target’s sanity to just about anyone who will listen. If there comes a time in the future when the target should decide to talk to others about the narcissist’s abusive tactics, why should anyone believe them when they know that this person is unbalanced and unstable? Remember that the narcissist is such a convincing liar, and often appears to be so very charming in public, that their ‘listening ears’ find no reason to doubt them. Who do people turn to for the right information? Certainly not the person being gaslighted. Once the target recognizes what is happening it is vital for them to understand that they will never stand on safe ground around this person. It is like walking on shifting sand. The narcissist will never take responsibility for their behaviour. Anyone who has been subjected to this form of abuse will almost certainly need counselling to build themselves back up to who they once were. A strong support system will work wonders. The feelings of self-doubt and low self-esteem will pass. Can they become a narcissist? I too just came out of a life with a narcissist husband. I have been cheated on the entire 5 years of our marriage. They won’t take responsibility for anything. He has seen his X girlfriend all through this time. It is the only one he owns up to and he doesn’t understand why I’m so upset. He says, well she was my girlfriend before you . Pardon me , but piss on that. So you would have to love him to be with him. Yet he still believes he can get any age woman he wants and he works real had at it. He tells me to leave all the time and I just laugh. Well this last time he said it I said Ok. Now I’m living with my daughter. He will not leave me alone. I’ve had t block him and just try to forget about the last 5 years that feels like 50. Be so grateful you had no children with him. They use the children to convince them you are insane, and then you struggle with the relationship with your children. This is also child abuse. And so painful to watch children you love be led astray.